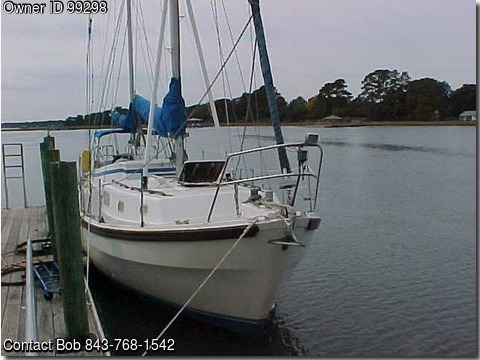 Please call owner Bob at 843-768-1542. Boat location is Johns Island, South Carolina. 40 ft.
LOD 1980 aft cockpit ketch, custom built in England by Rank Marine to Lloyd's specs. Forever Rosie is a custom aft cockpit version of the famous Salar 40, a Laurent Giles design. Solid FG below waterline, 1" thick at limberline. Coast Guard documented. 5 1/2ft draft, ll 1/2 ft beam, 76" headroom below.125 gallons diesel for Perkins 4-236 gives cruising range of 650 nm. 120 gallons water. Mase generator with separate 25 gallon diesel tank. Three cabins sleeping 7, two head/showers, one with Lectrasan permitting overboard discharge. Propane stove/oven, 110v AC and 12v. All mainmast shrouds and stays are 10mm (about 0.4 inch). All mizzenmast shrouds and stays are 8mm (about 0.3 inch). Stanchions and bow and stern railings all one inch stainless.Furuno radar, powered TV antenna, 110v/12v. TV, Firdell Blipper radar reflector, Nexus autopilot w/remote, 3 anchors (60# CQR, 33#Bruce,30#Danforth), two nylon rodes, third rode on reel in aft cockpit. Two gin poles, storm trysail, two genny's, awning, electric windlass, misc. items like bosun's chair, fenders, lines, bell, whistle, swim ladder, Life Sling, throw rope, man overboard lighted buoy. etc.10,000 pounds lead ballast, encapsulated, Max 3-blade self-feathering 18" prop, Lewmar 44 self-tailing winches, big portable manual bilge pump in addition to electric pumps. Bottom paint new in March 2014. No blisters.Forever Rosie is designed and built as an ocean voyager but has all the amenities for living aboard between cruises. Will show by appointment and will consider trade for trawler. Video taken in Spring 2014 is available at http://youtu.be/g_mlCVRldQU.